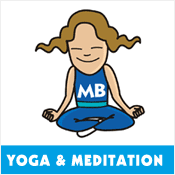 Warrawee Kid's Yoga and Meditation Program. Kids yoga North Shore. Moving Bodies has partnered with Clear Minded For Life to offer a great new Yoga & Meditation program for Warrawee Public School. This exciting new program will offer children an opportunity to learn about yoga as well as simple breathing techniques they can use at home or at school. Yoga for children is designed to be engaging as it provides simple movement and poses that both relax and strengthen the body whilst bringing calm to the mind. Children will be able to remember these poses and movements as they are taught from a child’s perspective, giving the children a beautiful skill for them to connect with their mind and body in simple, gentle exercise. Clear Minded For Life has been running meditation and breathing programs in schools for a number of years and these tried and tested methods will be part of the Yoga and Meditation program for Warrawee Public School students. Vicki O’Leary, who will be running the program at Warrawee, regularly teaches meditation in schools and has been facilitating yoga & meditation workshops at the Moving Bodies Centre for many years. Vicki has also held children’s yoga classes in Turramurra and is the CEO and Director of Clear Minded For Life.